Windscreen repairs normally are possible up to a cross-section dimension of 2,5 centimeters. In the edge region of the windscreen repairs are only limitedly possible. In the driver’s field of vision repairs are forbidden according to StVZO. Repairs do not make the damage invisible, even in the most favorable case. With our system, which is approved by the governmental “Materialprüfungsamt”, we can repair small stone chips in the windscreen in a very fast, low-cost and permanent way. 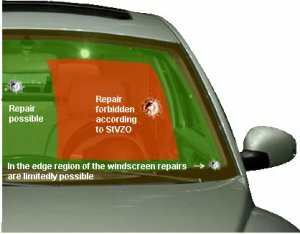 In about half of the cases of all cracked or damaged windscreens we can make sure that you have a clear view again, with the full functionality. This is important for the general inspection every two years. In this case, a small stone chip in the windscreen can be a major problem. Therefore, let your windscreen be checked instead of being annoyed afterwards. You have no time to worry about this? You do not have to, at least not much. The repair of stone chips in the windscreen takes about one hour inclusive fine polishing. In most cases this spares the time-consuming replacement of the windscreen. And along the way you contribute actively to environmental protection with the repair instead of replacement of the windscreen. The insurance settlement (no legal advice!) is part of our free of charge service. You had already enough stress with the damage, so you will now be able to sit back and relax.